Right to Write or *the* Right to Write? Right. The irony doesn’t escape me. Look no further than my bedside table, and it’s right there, taunting me. The titles of the concepts I strive towards, the sense of *being* I strive towards, sitting there, complacent. Pages not turned back, no bookmarks, nary an underline in sight. Like discarded toys of our youth, the reality that is not remains, next to me, waiting. For its time. Perhaps it’s now. I recently left my job. I’ve never done this before, willingly departing something that – for all intents and purposes, both me and the company for which I was working – was going quite well. Very successful, even. I chose the harder of the the options (those options being ones I presented myself) to honor some choices I was questioning…the nuance or perhaps the vast disparity between complacency and happiness. If not now, when? It was time to see how vast that chasm actually was. So I left. I’ve spent the last month or so on a self-declared Sabalatical (much more clever written; pronouncing it basically defeats the purpose), traveling and doing that thing you do when you’re 36 and single and living in the best city in the world and having every opportunity in front of you and not knowing what makes you happy anymore. I think they call it introspection. Or mid-life crisis. Tomato, tomahto. I took the leap, jumping on a plane with no agenda, turning off my phone and leaving the computer behind, writing in my journal (I believe that’s compulsory in these situations, no?) and asking myself all those hard questions you’re mandated to ask. Yet…it wasn’t the questions. It wasn’t the revelations, however plenty or few they were. It was the medium. And the sharing – or subsequent lack thereof – of the epiphanies. If you arrive at your life’s purpose alone in the woods – with no digital mechanism from which to share – does anyone hear you? Do you? I go on from there (and on, and on.) And the predictability of me reciting this here also doesn’t escape me, while the question remains. Are we sacrificing authenticity for our now-ingrained desire for recognition, for feedback? Are we carefully crafting our innermost thoughts to reach the Twitter perfection of 140 characters, adding the preferred Instagram filter, to get stars and hearts to stroke our own egos, to feel like someone, somewhere, hears us? Are we sending a digital message into the ether, only to create a physical manifestation of the rose-colored glasses into all aspects of our being? And in doing so, how far away from the truth have we strayed? 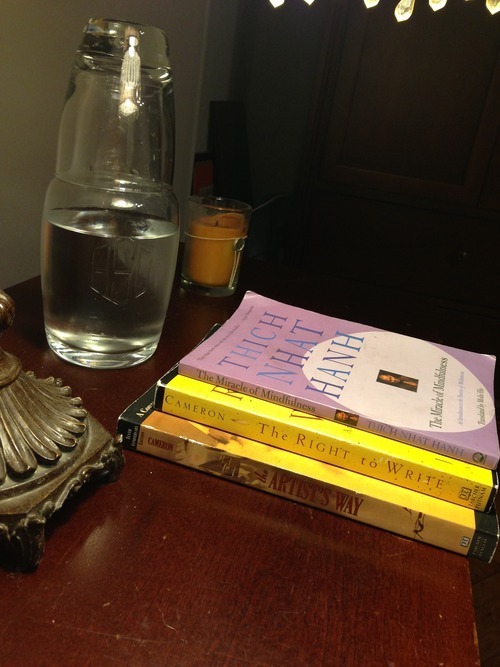 The three books on my bedside table are finally getting read. Chapter by chapter, exercise by exercise, as I question the gap between what we feel and what we say (not to mention how, where, or why), maybe sharing less – and listening, especially to ourselves, more – is the key. Or maybe I’ll hit publish and I’m the biggest hypocrite yet.